Irish media markets are among the most concentrated in the OECD. The dominant position of Independent News and Media (INM) has long been a feature of the national newspaper market and even with the loss of the Star on Sunday and the Sunday Tribune, INM titles still account for over 40% of all daily and Sunday national newspaper sales in Ireland. However, since 1995, the local/regional radio and press sectors have experience dramatic concentration. In 1990, there was virtually no cross-ownership in the commercial radio sector. Now, of the 37 national, regional and local radio stations 23 are part of media groups. Just three – Denis O’Brien’s Communicorp, Thomas Crosbie Holdings (TCH)/Landmark and UTV Media – own seventeen stations between them. In 1995 the bulk of the country’s regional and local newspapers were family- or privately-owned with only one regional group of any significance – owned by INM. As of 2010, there were fewer than 20 family/private local newspapers left, the rest absorbed by the likes of the Johnson Press, TCH, the Alpha Group, and the Celtic Media Group. That media markets ‘naturally’ tend towards oligopoly is financially logical. The production of all media texts – newspapers, television and radio shows or films – is characterised by economies of scope. As reproducing media texts costs a fraction of producing the first copy, there is a strong incentive to produce and sell as many copies as possible. Similarly, having produced content for one medium, there is a logic to re-purposing that content for other media. This logic finds expression in a tendency for media firms to operate at scale across media sectors, leading to the emergence of large-scale media conglomerates. TCH’s active pursuit of additional media outlets since 1999 not only exemplified this logic but also illustrated its potential pitfalls. From having no broadcasting holdings in 2000, TCH acquired, or invested in, 4FM, Beat FM, Red FM, Midwest Radio and WLR FM between 2002 and 2008. The four print titles owned by TCH in 1998 swelled to 18 by the end of 2008. Funding these acquisitions meant servicing long-term debt which rose to €19m by 2009, from effective debtlessness in 2005. However, the economic crash slashed radio and print media revenues: spending on radio advertising in Ireland dropped by 25% between 2008 and 2010. The figure for newspapers was even worse: between 2007 and 2010 press advertising expenditure more than halved. This prompted TCH to sell-off the Newry and Down Democrat paper to John Taylor’s Alpha Newspapers and the Sligo Weekender to Datascope Ltd in 2009. A year later, in 2010, TCH shutdown the Kerry-based Kingdom newspaper (the 1999 acquisition of which marked the start of the acquisition trail). However, even this couldn’t prevent the radical restructuring of the group and the placing of the Sunday Business Post into receivership. INM’s travails parallels those of TCH, albeit on a much larger scale. The acquisition of the London-based Independent newspaper in 1997 for €100m, drained its resources so INM sold it (and €150m of accumulated debt) for £1 to Alexander Lebedev in 2010. Other investments proved more successful but the decline of INM’s core Irish business forced the group to sell off its Indian and South African investments in a bid to meet its debt obligations. Even this has not been enough to tackle fully the €420m debt, with the result that INM is essentially seeking some kind of partial write-off or debt-for-equity swap arrangement from its lenders. However, the recent existential crisis for TCH and INM has temporarily obscured the longer-term political concerns raised by the scaling up of media firms. In a nutshell: given that newspapers, television, radio and other media firms reflect or construct reality, how wise is it to allow such power to be concentrated in the hands of a handful of media corporations which may have their own views on that reality? For decades in Ireland, the concern that a media group might exploit its dominant position for its own ends focused on Tony O’Reilly and his prominent position across the Irish media. 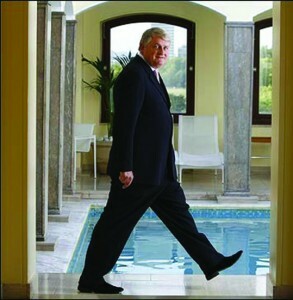 However, with the arrival of Denis O’Brien as the largest shareholder in INM from 2008 (and the concomitant ousting of the O’Reilly family from its hitherto dominant position), it is the former Digifone chairman who has come to symbolise concentration of media power in Ireland. In addition to his INM stake, O’Brien’s Irish radio holdings account for 25% of combined local, regional and national audiences, a market share second only to RTÉ Radio. There are examples of other countries in which the dominance of individual media groups exceeds that of O’Brien, but his dominant position across two media sectors simultaneously is an outlier by international standards. It is tempting to ask whether the INM investment was motivated by a desire for editorial influence. The acquisition of Today FM, along with Highland Radio and – briefly – FM104, from Emap in 2008, made obvious business sense, given the potential resultant economies of scale across his broadcasting holdings. However, the roughly contemporaneous decision to amass a stake in INM at a point when its share value was declining is hard to understand in purely financial terms. On the other hand, O’Brien’s entanglement with the Moriarty Tribunal clearly created an incentive to assemble whatever editorial resources were available to mount a defence of his position outside the confines of the Tribunal. If that was the strategy (and one might reasonably ask whether anyone would invest €500m to such an end) it was only partially successful: the relatively even-handed treatment of the Moriarty Tribunal’s findings about O’Brien in the Irish Independent was not reflected in the Sunday Independent’s more aggressive coverage. In that regard, however, the recent proposal to introduce an Editorial Charter whereby INM journalists would need the written approval of the Managing Editor before publishing “sustained or adversarial editorial material concerning individuals or organisations” might be interpreted as seeking to impose a certain chilling effect on journalistic independence. Given the litigious nature of Irish society, journalists may be reluctant to ascribe a desire for editorial influence to media owners. In passing though, it’s worth noting that no-one finds it unusual when Volkswagen asserts its authority over production decisions taken by Skoda, its subsidiary: why should this be any different in the media industries? However, the key point is not whether Denis O’Brien in particular can influence the editorial content of the radio stations he owns or of INM. Rather it is to point out how inherently problematic it is that the codes currently regulating media ownership in Ireland make it possible for any individual or organisation to acquire such potential political power. And, in this respect, much of the difficulty with the current regulatory framework lies in its over-economistic orientation and its unwillingness to acknowledge the inherently political nature of the media. Responsibility for regulation of media ownership is spread across the Competition Authority, the Minister for Jobs, Enterprise and Innovation, and the Broadcasting Authority of Ireland. In assessing a potential media merger, the Minister must consider a range of “relevant criteria” including: the strength and competitiveness of Irish media businesses; diversity of ownership and control of media businesses in the State; and the extent to which the diversity of views in Irish society is reflected through the media. Although the ultimate power to approve or oppose a merger lies with the Minister, the Competition Authority must furnish the Minister with an opinion on how the relevant criteria should be applied. However, as the Advisory Committee on Media Mergers noted in 2008 the Competition Authority is “ill-equipped to take ultimate custody of the important public interest issues involved. Its expertise lies in the economics of markets not in issues of plurality or diversity”. The Competition Authority agrees with this assessment, and has described the requirement that it assess the essentially political question of the impact of media mergers on diversity as “outside its area of expertise” and “unusual” by international norms. In practice, lacking objective criteria for defining diversity of content, the Competition Authority has applied market-competition criteria to deliberations on media mergers. Thus its discussion of Communicorp’s 2008 acquisition of EMAP’s radio holdings exclusively focused on the potential impact on the radio-advertising market. Consideration of Communicorp owner Denis O’Brien’s holding in INM (then 9%), was explicitly excluded on the ground that the newspaper-advertising market was entirely separate to the radio-advertising market. Given that the BAI’s code on ownership stresses the need for “open and pluralistic broadcasting services” and to “promote diversity in viewpoint, outlet and source”, one might expect that the BAI would emphasise diversity, in assessing potentially problematic broadcast mergers or acquisitions. Yet even the BAI’s approach is informed by quantitative considerations. The 2009 Broadcasting Act requires the BAI to avoid allowing any individual or institution to control an “undue number” of broadcasters. The BAI has interpreted “undue” as anything above 25% of the total number of licensed broadcasters. Anything up to 15% is considered “acceptable” while between 15% and 25% would require “careful consideration”. However, the number of stations owned may not reflect audience reach. Given the 37 licensed commercial radio and television stations, a media company would need to own 10 stations to breach definitively the BAI guidelines. Yet, as of 2012, Communicorp’s six stations (which include two national and one Dublin-based stations) cumulatively accounted for 25% of combined national and regional audiences. On the hardly controversial basis that there is some relationship between a media group’s influence in the public sphere and the size of its audience, the failure to use audience as a basis for market share seems perverse. Indeed when assessing cross-media ownership, (ie when a firm already active in non-broadcast media seeks to acquire a radio or television station), the BAI does use the firm’s share of the “audiences” for print, radio, television cable and/or satellite markets as a proxy for the firm’s “ability to influence opinion-forming power”. Yet, even a simplistic measurement of audience size may not offer a sufficient basis on which to assess opinion-forming power. In the UK, The Sun outsells The Times by a factor or 6 to 1 but can that straightforwardly be interpreted as meaning that The Sun has six times the political influence of The Times? From a political perspective, the focus on quantitative measures of media ownership as a basis for assessing the extent of media diversity is understandable: the market share of competing media groups can be objectively described to the nearest decimal point. Reference to such data allows regulators and politicians to assert that their intervention in media markets is based on definitive, consistent criteria; and reduces the possibility of a direct conflict with media owners. However, this approach assumes that the media can be regulated like any other industry, ignoring the inherently political role of the media. Measuring pluralism and diversity of content, on the other hand is a much thornier, and more politicised question: one that is hard to make amenable to even quasi-objective assessment. Nonetheless, in its deliberations in 2008, the Advisory Group on Media Mergers concluded any future Irish legislation on media should include a statutory definition of diversity of media content along the following lines: “The extent to which the broad diversity of views and cultural interests prevalent in Irish society is reflected through the activities of media businesses in the State”. Furthermore the Advisory Group recommended that the impact on diversity of content be included in assessment of whether to allow a particular media merger to proceed. The Advisory Group could have gone further, expanding the concept of diversity to encompass a requirement for media outlets to offer marginalised voices direct access to audiences. However, even the minimalist conception is potentially radical in requiring a (necessarily subjective?) judgement as to what views and interests are prevalent in society as a prerequisite for assessing the extent to which those views were reflected in the mass media. And, given the nature of that decision the Advisory Group was clear that the judgement should be made by a Government Minister who, as a democratically-elected official would be answerable to the Oireachtas: “There is no reason why the manner in which the Minister discharges the function [of assessing media mergers] should not be transparent and meet the needs of modern society”. Ironically, precisely this point was made by the Competition Authority in its 2006 Consultation on the Assessment of Media Mergers. Acknowledging the problems with a purely numeric approach to diversity, the Consultation argued that some judgement regarding the effect of a particular merger on the extent of diversity of view would have to be made. Crucially, however, the Consultation stressed that “these judgements need not be plucked from the air: they can be informed by relevant data” to be captured in the construction of a “media map” combining quantitative and qualitative measures of media power: “a description of the media landscape in Ireland that would minimally contain details of who owns what media businesses, who uses what media outputs, what degree of trust users accord to such outputs… the media map would also provide evidence on the practices of ownership and the orientation of particular media outlets with respect to major political, social and economic issues”. Though such a proposal would entail devoting some resources to establishing a relatively objective basis for capturing questions of trust and orientation, the tools for doing so (ie audience surveys and media-content analysis) are well-established in international media research. Sadly, however, although the imminent bill on media ownership seems likely to include some of the 2008 Advisory Group on Media Mergers recommendations (which is welcome), there seems little prospect that it will adopt the even more proactive approach envisaged in the Competition Authority’s 2006 consultation. In any case, it may be that since the Advisory Group’s 2008 report, the media landscape has altered in ways which make some of its recommendations less relevant. Though recommending that the internet presences of media groups be taken into account in assessing overall media market share, the Advisory Group made little reference to – then still emerging – social media. However, although the precise role of participatory media (Twitter, Facebook and other social media) in constituting the public sphere remains unclear, the ongoing decline of newspaper sales suggests that there is a shift occurring in the fabric of the public sphere. Whether this renders concerns about the dominance of particular individuals of traditional media less relevant or simply irrelevant remains to be seen.